In a large mixing bowl, thoroughly mix the dry ingredients. Combine all the wet ingredients, pour them into the dry ingredients, and stir until you have a soft dough, similar to biscuit dough. Turn the dough onto a well-floured surface and roll or pat it to about a 1/2 inch thickness. Cut the dough into rectangles about 2 by 4 inches. Bake the rusks about 2 inches apart on buttered baking sheet for about 25 minutes until the tops are crisping and browning a little. Now, eat a few "soft" rusks warm from the oven. Loosely pile the rusks on a baking sheet and keep them in a 200 degree oven all day or all night (about 12 hours) to dry. The finished rusks should be very dry and hard. Cool and store in an airtight container. Rusks will keep for weeks. Oatmeal-Raisin Rusks: Reduce the white flour to 1 1/2 cups and add 2 cups rolled oats and 1/2 cup currants or chopped raisins. Almond Rusks: Add 1 cup chopped almonds and omit the cinnamon. Peanut Rusks: Add 1 cup coarsely chopped peanuts. 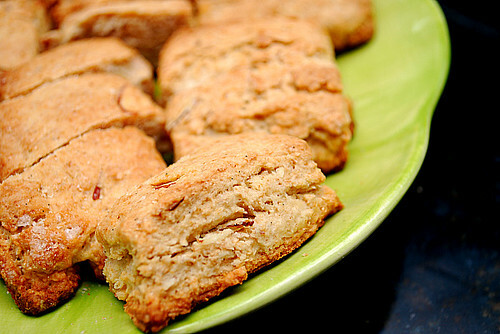 Anise Rusks: Omit the cinnamon and almond extract and add 2 tsp. pure anise extract or 1 Tbsp. anisette. Oooooh! I was looking for something different to do with my leftover buttermilk. These sound right up my alley. Thanks! Great post. I don't know anything about South African cooking. This recipe looks like it would pair perfectly with tea. Those look like a great with tea cookie. Thank you. Good content. Ended up being searching for a little while. Seeking more content of your stuff in the future.